It’s slightly strange to think that an excitable, dancing cactus is one of the most iconic enemies of one of the biggest RPG franchises of all time… but it is. 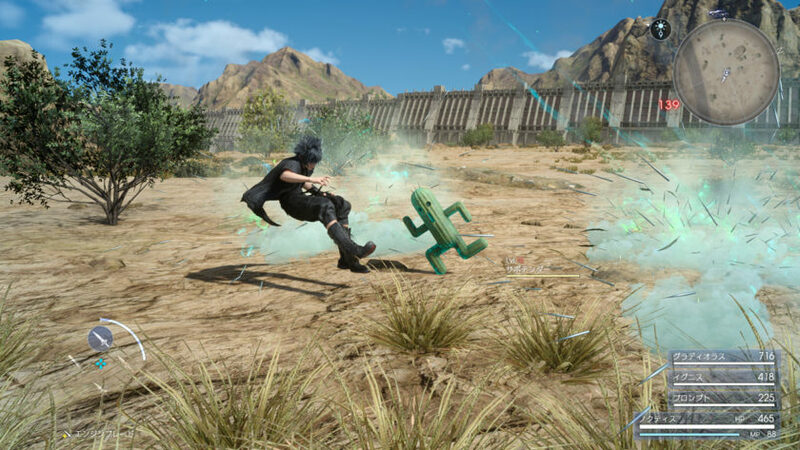 Cactaurs are a Final Fantasy classic, and so it’s no surprise that they also make an appearance in Final Fantasy 15 – but they’re remarkably rare and rather difficult enemies you can encounter. In my first play-through of FF15 it took me over thirty hours to see one – but if you know where to look, you can find one more easily. One advantage FF15 Royal Edition and PC Windows Edition players have is that they can use the knowledge of all those suffering PS4 and Xbox One players from a year ago for a leg up – and tracking down a Cactaur or two is one area where you can massively benefit. On this page, we’re going to help you to find – and fight – these elusive critters for some excellent loot. We’ve got even more FF15 help should you need it – just visit our extensive Final Fantasy 15 Guide hub! First off, it’s important to note that there’s three types of Cactuar in FF15 – the regular Cactuar, the Slactuar and the Gigantuar. The Cactuar and Slactuar type enemies are found in the same areas as far as we can tell. The two enemies are also pretty damn similar – you’ll certainly struggle to immediately tell the difference beyond the name. One place we’ve been able to reliably find them is in Leide – just north-west of Hammerhead and north of Longwythe on the map. They also definitely appear in Duscae, and tend to be found around the Perpetouss Keep enemy base area. Both of these enemies have a very low chance of spawning and as far as we can tell will mostly do so as the sun begins to rise – from 5am on, but not into the afternoon. You’ll want to hang around one of these areas a lot and use the monster-summoning whistle item in your L2 menu (from chapter 4 onwards) to keep summoning and spawning monsters until eventually one of them is a Cactuar or Slacktaur. Cactuar will try to run, so you’ll want to try to lock it down fast. It’s weak to Daggers and Gun type weapons. Avoid fire magic, as it resists that. Ice or Thunder are just fine, however. The same applies to Slacktaur. Gigantuar is found as part of a hunt in the game – so we won’t spoil details on that – just keep progressing the hunts and raising your hunter rank to eventually encounter it. First off – both the Cactaur and Slactuar are worth 3333 EXP. That’s a lot, especially for a (relatively) low-level enemy – in fact, it’s right up there with the items on our guide to leveling up quickly in FF15. Kill and cash in! Beyond that the pair also drop useful items. Cactuar enemies drop Oracle Ascension Coins. These useful items can be traded for high-value items and gear at a vendor in Altissa, but also make for powerful magic boosting items when crafting spells. Slactuar will drop the much-needed Cactuar Needle item. This item doesn’t have as much long-term utility as the coins, but is required for some weapon upgrade quests for Cid to upgrade some machine-type weapons, including some machine-type weapon upgrades. When you find yourself in need of one, go Slactuar hunting. Keep in mind that in many ways the Cactuar and Slactaur look and seem identical, and the latter is the rarer of the two – so you might be at it for a while.